I have always stayed with my Tangsa consultants during my field-trips in the last years. Although the Tangsas live not far away from big towns like Margherita, Ledo and Jairampur, their style of living and their food habits are very distinctive. I am rather cross with myself for not having really bothered so far to learn to cook a few typically Tangsa dishes. But, as often happens in the field, there always seems to be something more important to do, and later, it is just too late. The Tangsas are a small hill tribe who have migrated to India from Myanmar probably within the last couple of centuries and have settled in the north-east Indian states of Assam (mainly in the Margherita area of Tinsukia district) and Arunachal Pradesh (in the Changlang and Tirap districts). Most Tangsas today regard themselves as Nagas, but as a distinct group within them. The Tangsas in India comprise over 30 different sub-tribes , with considerable linguistic diversity, and although the cultural or linguistic difference between some groups may not be very large, there is a large amount of variation, allowing for further re-grouping of the Tangsa sub-tribes into Pangwas and Tangwas. Most of what I describe below is based on my observations and documentation of the food and life-styles of three Pangwa subtribes – namely Cholim, Lochhang and Rera, using the names they use for themselves – or alternatively, Tonglum, Langching and Ronrang, using the names others use for them. I have been working with the Tangsas since 2008 and have spent a few months in the field, both as part of a team with the other project-members and also on my own. What struck me most about Tangsa food when I first arrived in ‘Tangsa-land’ were the timings and the menu -- huge mounds of plain boiled rice (cham) formed the major part of every meal; and there were two main meals per day – the first rice meal was served around 7 a.m. – rice with a bland and very watery śak-soup , sometimes with a very hot and spicy chutney (basically a paste of tomatoes and chilles), sometimes with a spicy vegetable item and every few days a few pieces of roast or fried meat (mostly pork). My colleague Stephen, who is an egg-etarian, sometimes got a couple of boiled eggs instead. Another meal, with roughly the same items but even less elaborate, was repeated at dusk, around 4 p.m. The first Tangsa word I learnt almost automatically, out of sheer necessity, because I am somebody who cannot survive for long without tea, was phelap. Phelap is the black and bitter tea that the Tangsas left ‘cooking’ (more appropriately ‘smoking’) in a black and sooty kettle on a tripod over the hearth (not the inner kitchen hearth but the one in the adjoining outer area where the men usually sat) most of the time. Except for the one cup of milk-tea served in the morning (which was usually served sweet), the rest of the day one got mostly phelap. I was completely fascinated by the self-made and much-used bamboo mug which our host used to drink his tea from. Home-made wooden ladles, spoons etc. were also regularly used in the kitchen. They rarely used sugar in their tea, and even otherwise they had no idea of a dessert, did not cook anything sweet in all the time I was there, and also very rarely used milk or milk-products. Even the one cup of milk-tea we got in the morning was usually made with milk powder. I wondered about the children, but never saw a child being given milk to drink, probably a consequence of the fact that traditionally Tangsas did not rear cows. After mother’s milk, they moved straight on to drinking phelap, I guess. And their diet did not include fruits either, apart from a few, like bananas and papayas, that grew locally. Another omission was potatoes, simply because they did not grow it in the hills – Tangsas seldom eat potatoes even today. They eat cho (arum; kasu in Assamese) instead. The food is mostly boiled and roasted, they use hardly any oil for their normal cooking , nor our normal spices. But they did use chillies and some other herbs that made certain items of the menu really eye-wateringly spicy. One special vegetable that I encountered was called ‘khi-mo-jak’, which is a kind of vegetable they got from the jungles (called ‘nefa-phool’ in Assamese, I was told); although they ate it in the winter it turns very bitter in summer. Another herb which was commonly used at least in Balinong was called ‘nge-tang-pe’ (see picture above). Another vegetable, that I encountered for the first time in Balinong, was called, not surprisingly, 'sari-kona-sabji' or 'four-cornered-vegetable' (see picture below). It can also be eaten raw. While women did most of the usual cooking at home, at big festive occasions, it was usual to see the women in charge of making the rice, wrapping them in koupat and brewing the rice-beer (and also cutting tomatoes, onions and cucumber to make a sort of salad, which I assume is a modern addition) while the men were in charge of cutting, cleaning and cooking the meat – be it pork, beef, or of any other sort. I have often wondered about the reason for this obvious division of labour, but don’t have any clear notions yet. 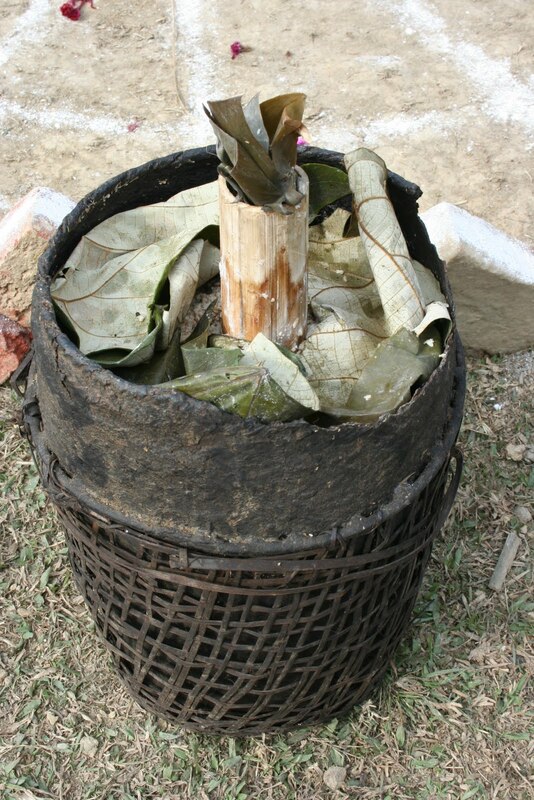 In the picture is a locally-made container for storing and serving rice-beer. Soon it was clear to me why the meal times were the obviously natural ones – the Tangsa villagers, who are predominantly farmers, try to work and sleep according to the sun (and that, given the very erratic and unreliable power situation in most villages, is a very sensible thing to do in any case). They get up almost before dawn, and the women start cooking the morning meal while the men tend to the pigs, the poultry and other animals. Soon after the morning meal, almost every able adult member of the house – men and women alike – leave for their tea-gardens , paddy fields or their vegetable patches where they work during the day. Some older member of family – usually a grandfather or a widowed grandaunt -- remain at home and took care of the kids, if any, left at home. The women return home only around 3 p.m. often carrying loads of fire-wood on their heads, while the men follow a little later, carrying leafy arum stems for pig fodder from the forests. Then the women begin with cooking the evening meal in the main kitchen, while the men cut up the arum stems and put them to cook in the outer hearth. By the time the animals are fed, the meal is eaten and the dishes done, it is well past 6 p.m. – and soon after it is normally bed-time for the Tangsas. Despite the over-consumption of rice at the price of under-consumption of almost everything else, the Tangsas are remarkably healthy and strong and hardy. And they have incredible stamina – especially the women, who never sit idle for a minute, and do not wait for their men to do the heavy work – I have often seen young Tangsa women running up the narrow wooden ladder of their chang-ghars carrying a full sack of rice (mostly half quintal sacks but often heavier too) on their backs, after having carried it from the fields on their bicycles for several kilometres. Of the various other facets related to food I tried to find out more about the use of food items for other purposes – such as for performing rituals, for doing augury and even for sending messages. In the village of Jengpathar in Arunachal Pradesh I was shown how messages were sent in olden times. As people were illiterate, the Tangsas would normally send little packets (called ‘gyeng-fit’) through messengers. Chillies and coal would mean bad news (usually war, in which case the fellow-tribe-members would make haste to come armed with guns and rifles ready to go and fight the enemy), rice for good news (like a birth or a marriage) and tea-leaves to express anger or unhappiness (as it was bitter). Meenaxi, i am writing an article on rice beerfor a magazine and would like to use your image of the Tangsa rice beer storage device. I am travel writer whose heart lies in the North Reast. Please give me permission to use the image and let me know what photo credit I should put.